The Sun Prairie Business and Education Partnership (BEP) provides a wide variety of programming within the Sun Prairie area schools. From businesses partnering with schools to provide reading buddies in the elementary schools to volunteering at the high school for a financial literacy event, BEP members have been giving back to the schools though many of the great programs below. 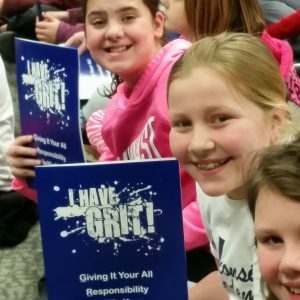 The GRIT Program is designed to support the building of the skills and character traits to help students succeed in the classroom and beyond. Students are recognized, with business partner participation, for displaying valued characteristic each quarter at all levels, elementary through high school, even at their places of employment. GRIT stands for Give it your all, Responsibility, Initiative, and Teamwork. Reality Rocks is a financial literacy project all High School students complete as part of their Economics class. The goal is to teach students about living within a budget in an interactive way that allows them to make financial choices and learn from them. Students are given a career, salary and family situation and through separate stations make decisions to provide for housing, food, daycare, insurance, etc. for their family based on the money they have to live on. The BEP arranges for its members and volunteers to be at each station helping students make financial and "life" decisions. There are also additional stations to teach them about credit, the cost of borrowing and the importance of saving and investing. Students learn the "reality" of living within a budget doesn’t always “rock”. The event is held each semester at the High School. 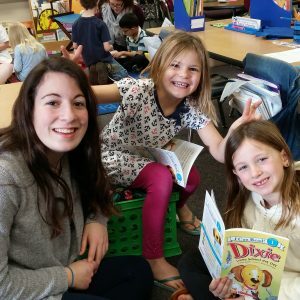 The Reading Buddy Program is where community members and/or business members are paired with a 1st grade classroom for the entire school year to read together. At the start of the year, students are given a bookshelf for their home, made by the high school technology students. Each month (for 9 months) the partner reads a new book to their classroom. Students take that book home with them to add to their own personal library. Teachers of the 1st grade classrooms are in contact with their community member and/or business person on a regular basis. Together, they will work out a schedule of dates to come into the classroom to read to the students and hand out the books after that reading. Students will be given an additional book to add to their library during the month of their birthday. The First Grade “Reading Buddy” Home Library Building Program has expanded to include all first grade classrooms in the district. “Prairie Voices” is a writing publication published annually which highlights student written work in grades K-12. The publication recognizes over 400 students every year. Teachers select and submit work as possible pieces for the end publication. The selected students are acknowledged in a special publication ceremony at the Sun Prairie High School Performing Arts Center in the spring where a guest speaker, usually a published author, shares his or her writing journey and inspires the students to continue writing. Each student receives a copy of the publication and a certificate. In a mock interview format through particular courses which offer this opportunity, BEP members interview and provide feedback for students in grades 8-12. This event helps prepare students for their first job interviews. Interviews are given at Cardinal Heights Upper Middle School, Prairie Phoenix Academy, and Sun Prairie High School. Various career representatives set up their "exhibit hall" booth in the Cardinal Heights Upper Middle School (CHUMS) cafeteria. This occurs in conjunction with the "Introduction to High School" meeting for our eighth grade students as well as the course expo night. This allows students to use their career research completed with their guidance counselor and meet different representatives from careers related to the results of that research. 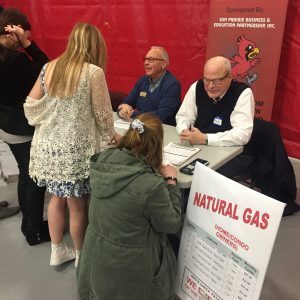 Students interview the representatives to discover more about the careers while reinforcing the importance of the educational classes they can discover that evening as well. Eighth grade students in the AVID(Achieving Via Individual Determination) program meeting specific qualifications are recommended by school personnel to apply for this scholarship. BEP members adopt an 8th grade student and then follow their academic and attendance progress through 12th grade. Upon high school graduation, students receive a $1,000 scholarship. Half of the scholarship money is provided upon completion of post-secondary course registration. The second half of the scholarship is given to the students upon successful completion of the semester. Students who have improved their GPA by 1.0 point or more from the previous grading period are presented certificates and a reward in the form of either a gift card or a coupon from a local business. Members of BEP make the presentations to each student individually by going to their classrooms and recognizing them in front of their peers. A day for local business representatives to come share their career choice or personal hobby with middle school students. This day coincides with the work of students services and the Career Cruising program, as students are continuing to explore careers and interests as they prepare for high school courses. A local business adopts an elementary school and comes along side that school for various school events and classroom activities. The business will likely participate in the Adopt a Classroom program. The business or departments of the business will partner with classes. This partnership will learn from each other. For example, students may visit the local business to learn more about that business. Business employees will visit classrooms and either participate in classroom activities or volunteer. The specifics of the partnership are flexible and will be defined by both the business and school. Generally there is an event that kicks off the Adopt a School program where the business comes to school and shadows and observes the “workings” of the school. The Sun Prairie Business and Education Partnership (BEP) was established in 1989, with a small budget and one or two projects each year. Since then, every project that BEP has sponsored has come from a teacher/administrator or business member who saw a need to get the business community involved in the schools. Over the past 30 years, the SPBEP has grown from a few school-to-business partnerships to a wide variety of programs serving all students in all levels of the Sun Prairie Area School District. ©2019 e-Media Resources. All Rights Reserved.